In the most recent Dallas Business Journal, Irving / Farmers Branch Express was listed as the 2nd largest staffing firm (in terms of number of hours billed per year). Having been established in 1988, we are the metroplex's oldest Express office and Dallas County's largest! Our franchise owners , Mike and Arie Overby, have over 25 years of experience with Fortune 100 Corporations at the executive management level, specializing in human resources and operations, resource management, and call center management. We are also a HUB Certified / Woman Owned Small Business Enterprise and ISO:9001-2000 certified. In 2013 - 2015, our Irving / Farmers Branch Express received the honor of being one of 100 businesses in the nation to receive the U.S. Chamber of Commerce's "Small Business Blue Ribbon". From 2011 - 2015, we were named "Best In Irving" within the Staffing Industry and in 2015, "Best Small Business in Irving" in the annual Chamber of Commerce surveys. At a national level, Express Employment has been named by CareerBuilder as "Best of the Staffing Industry" (Top 2% of all staffing firms). Let's Get Back to Work Dallas Metro! Express Employment Professionals are here to help you achieve your employment goals and get you back to work! Our company’s mission to get one million people a year into their desired workforce may be lofty - but it's far from impossible! Since 1988, our team of certified Staffing Consultants have been acting as the bridge that connects our community's most qualified Job Seekers with respectable Employers, so that successful workforce placements can be made. We want to reach and surpass our mission, each year, so in order to do that we have to continue to provide services that go above and beyond your expectations of a staffing agency. The Express Experience is a unique one - we have the atmosphere of a small business, but are able to offer corporate level tools, resources, and networking to our clients thanks to the support we receive from Express headquarters. This one-of-a-kind mixture is the reason we are able to give our clients the attention and well-rounded staffing experience that they expect and deserve. We are a ISO:9001 certified agency, so when we recruit for your “just-in-time” workforce, we are using the most up-to-date recruitment processes to make the most accurate pairings possible. And when you come to us looking for employment, we have you go through our easy to use, but extremely effective hiring process so that we can collect your individual needs, availability, and skills, match them up with our current list of job openings, and then offer you those employment opportunities, which come in a variety of temporary, short-term, long-term, flexible, and contract placements. We offer ongoing educational opportunities, designed to give you useful information that will prove useful to you while running or working within the workforce, such as our webinars and annual Refresh Leadership Live Simulcast. “Employee Morale and Engagement”, “Communicating With and Getting the Most From Your Employees” and “Conflict Management”, are some of the topics we covered in these webinars. We also have Lunch N’ Learn programs that can be done in your office, which cover a variety of tops, like “Generations in the Workforce”, “Learn to Lead”, “How to Be the Employee Your Employer Can’t Live Without”, as well as many others. If you’re looking for work or looking for a workforce, give our team a call at (972) 258-4981 to see how we can help you better your current situation! Express opened its first Dallas office in Irving, Texas, in 1988. Since then, we have established 14 additional Express offices throughout the DFW metroplex. 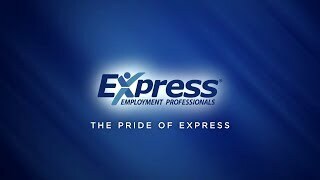 Express is rated as one of the largest staffing services in the Dallas/Fort Worth area.